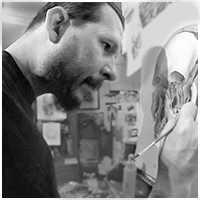 Steven Daily is a painter, illustrator, commercial artist and muralist who has exhibited his work at galleries and museums around the world. At age five Steven started creating art - drawing, traditional painting, illegal graffiti and skateboarding which all heavily influenced his subject matter and technique. He continues to attract new audiences with his style of artwork which combines traditional painting and contemporary art. Steven's art is inspired by personal beliefs, ideals, childhood memories, interpretations of old myths, legends and religious stories; yet retains the openness for individual interpretation via rich symbolism and iconography.